A long time ago, the C-Class was considered the Baby Benz of the Mercedes sedan lineup. Then came the CLA, a small, basic 4-door "coupe" that became the least expensive Benz that you could buy Stateside. It wasn’t so much a success for its technical brilliance as much as it was for the allure and power of the 3-star emblem. Now that the A-Class sedan has taken its place as the budget-conscious Mercedes, the CLA has some room to be a bit bigger, more stylish, and packed with the latest in infotainment technology. It’s also engineered to be more enjoyable to drive, according to Mercedes. The 2020 CLA is set to compete with the likes of the Audi A3 and BMW 2 Series. The 2020 CLA is bigger, longer, lower, and wider than its predecessor. The wheelbase has been lengthened as well, and with the wheels pushed out to the corners and wearing your choice of 18- or 19-in. wheels, the CLA sports an athletic stance. The point of a 4-door coupe is to give the appearance of a coupe but retain the functionality of a 4-door sedan. Like every 4-door coupe, this is done by manipulating the silhouette, elongating the greenhouse, and eliminating angles and the inherent boxiness of a sedan. The hood of the CLA is sloped, as is the line of the boot; together, it creates a nice, sleek, slippery side profile. Press photos of the new CLA feature a CLA Edition 1 appearance package with fetching orange accents inside and out, but it's doubtful that it will be available in the U.S.
Mercedes rids the CLA of its dashboard cowl, giving the interior a more modern, airy look. A big, freestanding instrument panel extends itself to merge with the infotainment system screen. Climate controls are simplified with cleaner buttons, and it looks like there are secondary touchpad controls in front of the center console bin. An available active damping suspension lets you customize the CLA’s ride to your preference. Active LED headlamps can also be had for a price; they’ll quickly turn as you steer to keep the road optimally illuminated. The cool augmented reality feature from the A-Class will also be available for the CLA. It provides a live camera view of the street that you’re on and superimposes arrows on the screen to give you directions, or numbers on the buildings so you don’t go knocking on the wrong door. 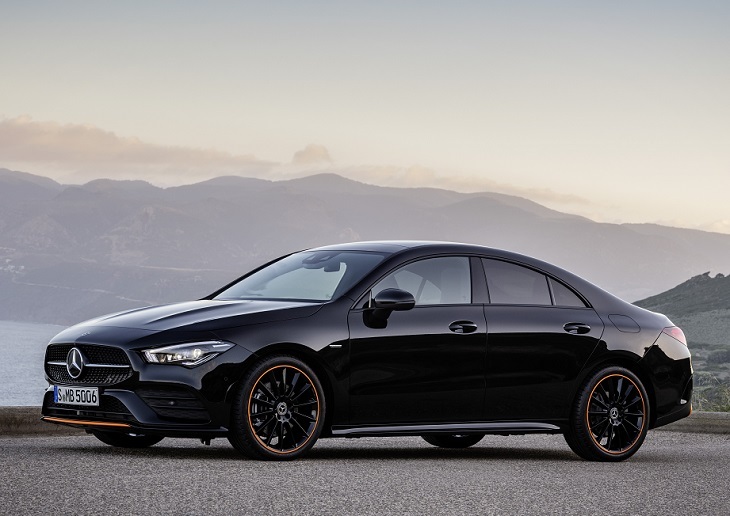 The 2020 CLA will debut in America with a 221-horsepower, turbocharged, 2.0-liter 4-cylinder engine. A 7-speed dual-clutch transmission will deliver the power to the front wheels, or the 4Matic all-wheel-drive system. European versions will offer diesel powertrains and manual transmissions, but alas, Americans have limited attention spans for three pedals. Word on the street is that we’ll see an AMG-massaged version very soon. Mercedes tends to be at the forefront of active safety technology, and generously ladles the CLA with the latest and greatest. When properly equipped, Mercedes claims that the 2020 CLA can drive semi-autonomously. Active Distance Assist Distronic takes into account existing navigational data on road speed and adjusts the car’s speed accordingly. There’s automatic emergency braking and active lane-keeping and lane-change assist, along with Pre-Safe Plus that can recognize if you’re about to be rear ended; it’ll help keep your car stationary to keep from causing another collision. The MBUX infotainment of the 2020 CLA will be able to recognize complex commands, so that you can give it input in a more natural way. For instance, it will be able to comprehend and find the answer to this type of query: “Find child-friendly Asian restaurants nearby with a 4-star rating which are neither Chinese nor Japanese.” That’s a pretty convoluted command, and we can’t wait to try to stump the system ourselves. MBUX is also able to disregard chatter from other passengers, only adhering to the voice of the person who summons “Hey Mercedes.” The system can learn the personal habits of different drivers using it, and store favorites. Want to turn the overhead lights on or off? Just wave your hand in front of it.